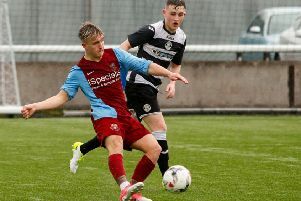 They did what they had to do and beat the East Lothian side 4-0 but with Linlithgow winning as well Brian McNaughton’s men will have to do it all again on Saturday at Stirling University. Broxburn got off to a great start with the award of a soft penalty after Zander Miller was sent sprawling; Craig Scott scoring easily. It then got frustrating for the visitors before Jack Beasley eased their frustrations with a second goal before the break. A wonderful free kick from Beasley added a third after the interval with Ross Nimmo scoring one of his specials. Linlithgow were soon at ease after scoring twice in the opening half hour; Roddy MacLennan and Gary Thom on the scoresheet. The home side pulled a goal back but Tommy Coyne restored the two-goal advantage just before the break. MacLennan’s second of the match eased tension. Bonnyrigg were beaten for the first time in the league, 3-1 by Max Christie’s unbeaten Bo’ness. Bonnyrigg have won their conference B title but the aim was to go through unbeaten in the league, but sadly with so many players out of contention they lost at home. Brian Morgan and veteran Stuart Hunter gave Bo’ness a two-goal lead at the break before Johnny Brown was red carded for the home side. Substitute Keith Lough headed Bonnyrigg back in contention but a goal from Marty Wright gave the visitors space. Haddington were beaten 4-1 at to Crossgates.